Add H3K27ac polyclonal antibody - Premium to my shopping cart. Request a quote for a bulk order for H3K27ac polyclonal antibody - Premium. Please fill out the form here below. Your local sales account manager will get in touch with you shortly and send you a quotation based on your requirements. Polyclonal antibody raised in rabbit against the region of histone H3 containing the acetylated lysine 27 (H3K27ac), using a KLH-conjugated synthetic peptide. * Please note that the optimal antibody amount per IP should be determined by the end-user. We recommend testing 0.5-5 μg per IP. 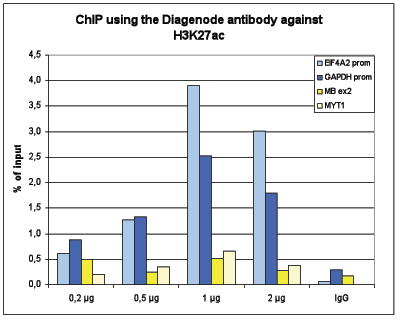 Figure 1A ChIP assays were performed using human HeLa cells, the Diagenode antibody against H3K27ac (Cat. No. C15410196) and optimized PCR primer pairs for qPCR. ChIP was performed with the ““Auto Histone ChIP-seq” kit (cat. No. AB- Auto02-A100) on the IP-Star automated system, using sheared chromatin from 1,000,000 cells. A titration consisting of 1, 2, 5 and 10 μg of antibody per ChIP experiment was analyzed. IgG (2 μg/IP) was used as a negative IP control. Quantitative PCR was performed with primers for the promoters of the active EIF4A2 and ACTB genes, used as positive controls, and for the inactive TSH2B and MYT1 genes, used as negative controls. 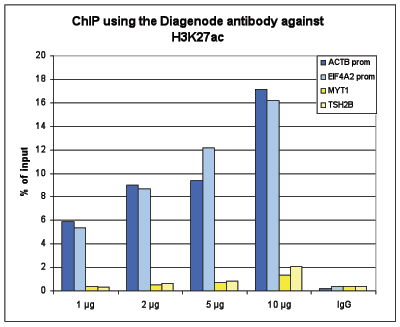 ChIP was performed on sheared chromatin from 100,000 K562 cells using 1 μg of the Diagenode antibody against H3K27ac (Cat. No. C15410196) as described above. The IP’d DNA was subsequently analysed on an Illumina Genome Analyzer. Library preparation, cluster generation and sequencing were performed according to the manufacturer’s instructions. The 36 bp tags were aligned to the human genome using the ELAND algorithm. Figure 2A shows the peak distribution along the complete human X-chromosome. Figure 2 B and C show the peak distribution in two regions surrounding the EIF4A2 and GAPDH positive control genes, respectively. The position of the PCR amplicon, used for validating the ChIP assay is indicated with an arrow. To determine the titer of the antibody, an ELISA was performed using a serial dilution of the Diagenode antibody against H3K27ac (Cat. No. C15410196). The antigen used was a peptide containing the histone modification of interest. By plotting the absorbance against the antibody dilution (Figure 3), the titer of the antibody was estimated to be 1:8,300. To test the cross reactivity of the Diagenode antibody against H3K27ac (Cat. No. C15410196), a Dot Blot analysis was performed with peptides containing other histone modifications and the unmodified H3K27. One hundred to 0.2 pmol of the respective peptides were spotted on a membrane. 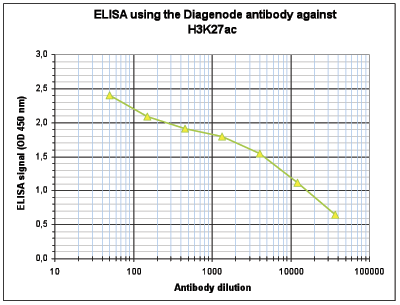 The antibody was used at a dilution of 1:20,000. Figure 4 shows a high specificity of the antibody for the modification of interest. 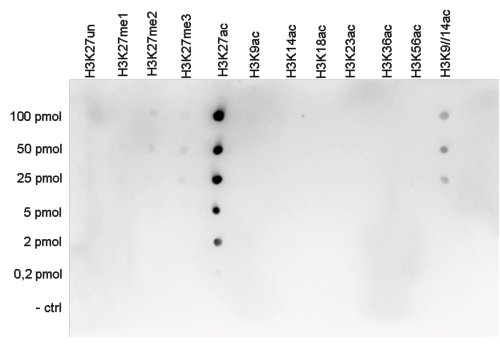 Western blot was performed on whole cell (25 μg, lane 1) and histone extracts (15 μg, lane 2) from HeLa cells, and on 1 μg of recombinant histone H2A, H2B, H3 and H4 (lane 3, 4, 5 and 6, respectively) using the Diagenode antibody against H3K27ac (Cat. No. C1541196). The antibody was diluted 1:1,000 in TBS-Tween containing 5% skimmed milk. The marker (in kDa) is shown on the left. HeLa cells were stained with the Diagenode antibody against H3K27ac (Cat. No. C15410196) and with DAPI. Cells were fixed with 4% formaldehyde for 10’ and blocked with PBS/ TX-100 containing 5% normal goat serum and 1% BSA. The cells were immunofluorescently labeled with the H3K27ac antibody (top) diluted 1:500 in blocking solution followed by an anti-rabbit antibody conjugated to Alexa488. The middle panel shows staining of the nuclei with DAPI. A merge of the two stainings is shown at the bottom. I am working with the True MicroChIP & Microplex Library Preparation Kits and several histone modification antibodies like H3K27ac, H3K4me3, H3K36me3, and H3K27me3. I got always very good and reproducible results for my ChIP-seq experiments. 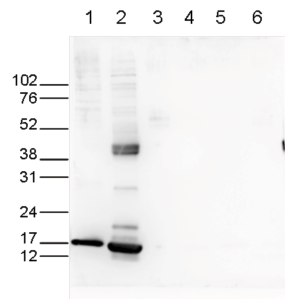 Diagenode strongly recommends using this:	H3K27ac polyclonal antibody - Premium (Diagenode Cat# C15410196 Lot# A1723-0041D). Click here to copy to clipboard. The role of TCF3 as potential master regulator in blastemal Wilms tumors. High-throughput ChIPmentation: freely scalable, single day ChIPseq data generation from very low cell-numbers. TRPS1 Is a Lineage-Specific Transcriptional Dependency in Breast Cancer. Impact of human sepsis on CCCTC-binding factor associated monocyte transcriptional response of Major Histocompatibility Complex II components. Mapping molecular landmarks of human skeletal ontogeny and pluripotent stem cell-derived articular chondrocytes. Atopic asthma after rhinovirus-induced wheezing is associated with DNA methylation change in the SMAD3 gene promoter. A Somatically Acquired Enhancer of the Androgen Receptor Is a Noncoding Driver in Advanced Prostate Cancer. Enhancer-driven transcriptional regulation is a potential key determinant for human visceral and subcutaneous adipocytes. The Polycomb-Dependent Epigenome Controls β Cell Dysfunction, Dedifferentiation, and Diabetes. Increased H3K9 methylation and impaired expression of Protocadherins are associated with the cognitive dysfunctions of the Kleefstra syndrome. UTX-mediated enhancer and chromatin remodeling suppresses myeloid leukemogenesis through noncatalytic inverse regulation of ETS and GATA programs. Bcl11b, a novel GATA3-interacting protein, suppresses Th1 while limiting Th2 cell differentiation. The novel BET bromodomain inhibitor BI 894999 represses super-enhancer-associated transcription and synergizes with CDK9 inhibition in AML. Comparative Analysis of Immune Cells Reveals a Conserved Regulatory Lexicon. Epigenetic modifiers promote mitochondrial biogenesis and oxidative metabolism leading to enhanced differentiation of neuroprogenitor cells. Ezh2 and Runx1 Mutations Collaborate to Initiate Lympho-Myeloid Leukemia in Early Thymic Progenitors. Allele-Specific Chromatin Recruitment and Therapeutic Vulnerabilities of ESR1 Activating Mutations. Metabolic Induction of Trained Immunity through the Mevalonate Pathway. BCG Vaccination Protects against Experimental Viral Infection in Humans through the Induction of Cytokines Associated with Trained Immunity. The non-coding variant rs1800734 enhances DCLK3 expression through long-range interaction and promotes colorectal cancer progression. Non-coding recurrent mutations in chronic lymphocytic leukaemia. Xose S. Puente, Silvia Beà, Rafael Valdés-Mas, Neus Villamor, Jesús Gutiérrez-Abril et al. Epigenome mapping reveals distinct modes of gene regulation and widespread enhancer reprogramming by the oncogenic fusion protein EWS-FLI1. Genome-wide and single-cell analyses reveal a context dependent relationship between CBP recruitment and gene expression. Add iDeal ChIP-seq kit for Histones to my shopping cart. Add H3K4me3 polyclonal antibody - Premium to my shopping cart. Add H3K9me3 polyclonal antibody - Premium to my shopping cart. Add H3K27me3 polyclonal antibody - Premium to my shopping cart. Add Auto True MicroChIP kit to my shopping cart.